I am staying at the guesthouse at St. John the Evangelist in Cambridge, Massachusetts for the holidays, because I love to sit with the monks as they sing. They have the most amazing, soul-shuddering harmonies. Anyway, this morning at prayer service I sat right in front of a beautiful manger display from Jerusalem. My eyes kept returning to small statues of the animals depicted in this particular scene: the cow, the ox, the donkey, sheep, goats and even some camels. I could picture dogs and cats running around happily in the background, off-camera, so to speak. And it really warmed my heart to know that these sweet and gentle creatures were present at the birth of the Christ. They stood witness before and therefore were part of this sacred family. That's no small thing! I know there is debate as to whether animals were actually present at this sacred birth, but regardless: we 21st-century humans should try to remember that these animals are all noble and sacred beings and deserve to be treated with respect, love, and reverence. As do we all. Their (and our) ancestors knelt at the cradle of the Christ. May it be so! 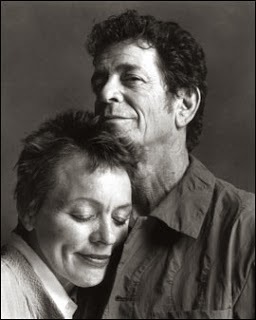 Laurie Anderson on Lou Reed's "Good Death"
As a meditator, I was very struck by Laurie Anderson's farewell tribute to her husband Lou Reed in Rolling Stone magazine. Sometimes it can feel as though our meditation practice isn't "doing anything" or "getting us anywhere." But Laurie Anderson's essay gives a clear example of just how beneficial a strong meditation practice can be: it can help transform the moment of death from one of fear and uncertainty into one of peace. I encourage you to read this. Grief has changed my voice. Usually when I sing lead there's this inner flame that I can access and pull up and out through my voice. I can't find that flame right now. I'm not saying that this is a permanent situation or a catastrophe; it's just interesting to go inside oneself and discover something missing. But....I am going back into the studio with Gaura Vani and friends to record more vocals in a few weeks. Please pray that my voice returns by December 8th! The latest installment of "The Chloe Chronicles" is here. The new print edition of Bark magazine just came out and I just re-read the latest installment "The Chloe Chronicles," which I handed in about three weeks before Chloe died. In this piece, I wrote about how Chloe was slowing down and showing signs of aging. I wrote about how I was starting to worry that some day she might get sick and die. I had no idea she was actually quite sick, yet as I re-read the piece, the signs are there. I don't know how to react. I could feel ashamed and horrified that I treated her "signs of aging" so lightly; or I could feel awed that, at some level, we got to say goodbye in such a deep way. What awes me most is the pull-quote Bark chose to use. A few months ago, when I expressed my concerns about Chloe that I wouldn't be able to handle it if she got sick, she said (telepathically, of course): "Don't worry. We are together now. That's all that matters. And when the time comes, you will still be with me and I will be with you." Thank you, Bark magazine, for publishing The Chloe Chronicles and allowing me to honor her in this way.